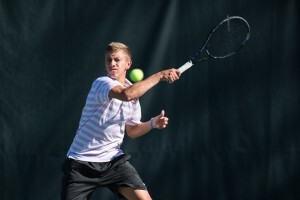 Stanford’s men’s tennis team extended its winning streak to 10 matches against No. 55 San Francisco (11-8) on Tuesday, defeating the Dons 4-2 at Taube Family Tennis Stadium. The streak marks the program’s longest winning streak since winning 13 consecutive games in 2011. Freshman David Wilcynski has established himself as a consistent winner for men’s tennis this year, helping Stanford along it’s ten game win streak. (DAVID BERNAL/David Bernal Photography). The No. 24 Cardinal (16-4, 6-0 Pac-12) have managed to rise through the rankings rapidly, reaching their highest spot since February 2013. The team has managed to rise from No. 43 on March 28 all the way up to No. 24 for today’s match on April 14. Stanford dominated the doubles matches with sophomore Yale Goldberg and freshman David Wilczynski winning 6-1 on the third court, before the No. 22 pairing seniors John Morrissey and Robert Stineman followed with a 6-0 win to clinch the point. Freshman David Hsu won the first singles match 6-0, 6-1 to extend Stanford’s lead before USF started its push back. USF’s Bernardo Saraiva first defeated Morrissey on the first court 6-3, 6-1. The Dons then tied the score 2-2 when Vasco Valverde came out on top on the fifth court over junior Maciek Romanowicz, 6-1, 6-3. Despite the scare, the Cardinal managed to pull out the victory with wins on the second and third courts. Wilczynski pulled out a 6-4, 6-4 victory over USF’s Nils Skajaa to regain the lead, and then Stineman solidified the victory with a 6-4, 6-4 triumph over James Tallman at the No. 3 spot. Junior Nolan Paige’s match on the fourth court was then abandoned. On Saturday, Stanford matches up against No. 28 Cal in its final match of the regular season. After this run, highlighted by the victories against No. 5 USC and No. 15 UCLA this weekend, Stanford has the opportunity to clinch a Pac-12 title with a victory this weekend.